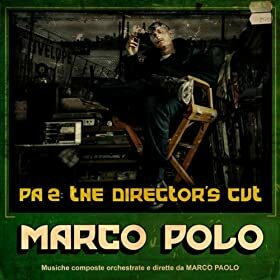 Wayne's Hip Hop Blog : A brief review of Marco Polo's "PA2: The Director's Cut"
A brief review of Marco Polo's "PA2: The Director's Cut"
This is Marco Polo's long awaited follow up to 2007's "Port Authority". After "Newport Authority 2" served as somewhat as a musical appetizer this year, "PA2: The Director's Cut" is here. All tracks are produced by Marco Polo and along for the ride are some of the most underrated MCs you can possibly think of in today's hip hop world. Let's check it out! The album begins with the reuniting of Organized Konfusion on "3-0-Clock". Pharoahe Monch's wordplay remains intact and while Prince Po sounded a little different, it's still nice to hear them together again. There's nothing like starting an album with a highlight, and trust me there are more to come on this album. "Astonishing", which features Large Professor, Inspectah Deck, O.C. and Tragedy, is just that, or should I say it's "astonishingly dope". Rah Digga, formerly the first lady of the Flipmode Squad, she comes through and shows she still has it on "Earrings Off", and when those earrings do come off, you know what time it is! Digga isn't the only femcee to rep on here, as Invincible laces us with the very good "Drunken Sleuth". The goodness continues with Talib Kweli's nice tribute to the late Guru (of Gang Starr) on the appropriately titled "G.U.R.U." (this is likely the album's best song), the Lil Fame, Styles P and Kardinal Offishal featured "What They Say", Gangrene (Alchemist & Oh No) on "Strange Brew", The Juggaknots' Breezley Brewlin talking about the uplifting of today's children on the positive "Parental Discretion", and "Savages", with Celph Titled, Ill Bill and Slaine. And of course we get a good closer on "Glory (Finish Hard)", featuring Masta Ace, A.G. and Posdunos. Other songs on the album are ok, but that's about it. The MC Eiht and King Tee cut "West Coast Love" was decent lyrically, but I wasn't feeling the beat too much. Malcolm & Martin's "Emergency Man" was also decent, while "Sucka Free" (featuring Blaq Poet, Hannibal Stax and Panchi) could've been much better and "Wrong Girl" (featuring Reach and Reggie B) is almost out of place on an album like this. Well, it goes without saying that this "director's cut" is not on the level of its predecessor from 2007, but make no mistake about it, the album is still dope. The simple yet effective practice of dope beats and rhymes will ensure the success of this album, and sometimes that's all that's needed. A solid 4 star rating for "PA2: The Director's Cut" and a recommendation to check it out.